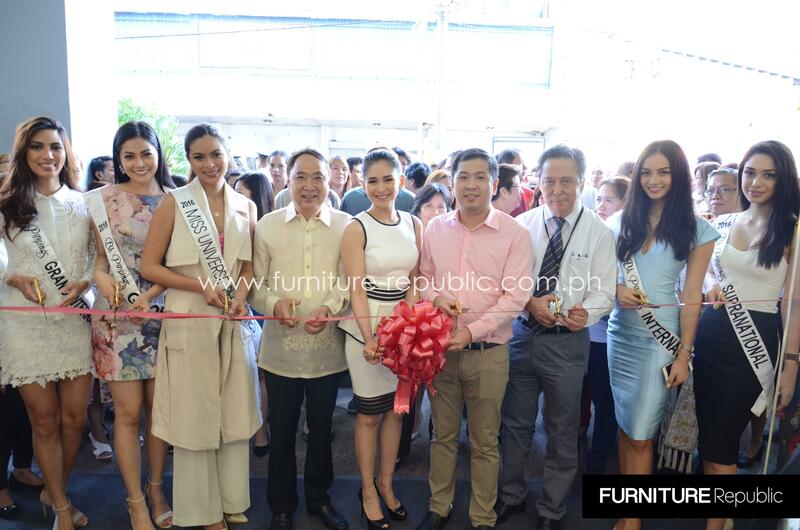 It was a star-studded affair at the grand opening of Furniture Republic’s 9th showroom in G/F Manhattan Parkview, Araneta Center on the afternoon of September 2, 2016. The launching of the 1,500 square meter project was graced by Furniture Republic President Mr. Tomas Cua, Finance Director Mr. James Cua, Furniture Republic brand ambassador Ms. Sarah Geronimo, and the 2016 Bb. Pilipinas queens, Bb. Pilipinas Universe Ms. Maxine Medina, Bb. Pilipinas International Ms. Kylie Verzosa, Bb. Pilipinas Supranational Joanna Eden, Bb. Pilipinas Grand International Ms. Nicole Cordoves and Bb. Pilipinas Globe Ms. Nichole Manalo. Also present in the event were top executives from The Araneta Center, some of the most celebrated businesspeople in the country today, and various renowned interior designers. The ribbon was cut by President Mr. Tomas Cua, Finance Director Mr. James Cua, brand ambassador Ms. Sarah Geronimo, and the 2016 Bb. Pilipinas queens. The blessing was presided by Rev. Msgr. Alfonso Bugawan Jr. of Perpetual Help Parish Cubao. The ribbon cutters participating in the coins and candies shower to signify luck and prosperity. The program kicked off with an opening prayer led by Audit Manager, Ms. Helen Joy Santos. The program was hosted by blogger, model and ABS-CBN courtside reporter, Janeena Chan. Through the generosity of the owners of Furniture Republic, there were also 3 raffle draws for gift cards worth P5,000, P10,000 and P15,000. The first raffle worth P5,000 was drawn by acclaimed interior designer Mr. Michael Pizarro. The second raffle worth P10,000 was drawn by Mylene Co of Amsamm Property Development Inc. The grand prize of P15,000 gift card was chosen by pop princess Ms. Sarah Geronimo and the lucky winner was none other than Bb. Pilipinas Grand International 2016 Ms. Nicole Cordoves, who stayed behind after the program with her interior designer friend Bb. Pilipinas Universe 2016 Ms. Maxine Medina to pick out furniture for her home. Nicole cashed in her gift card on the same day, picking up 2 lamp shades and accent chairs from Furniture Republic. The event marked the successful opening of another Furniture Republic store, their 9th over a period of 6 short years. Of course, the company’s continuing success is made possible by the support of various friends, loyal clients, and interior design partners.